When you have a web application which requires some getting used to from your users, a walkthrough of the interface is in order. Creating a walkthrough directly on top of the interface makes things very clear, so that’s what we’re going to build, using Bootstrap Tour. 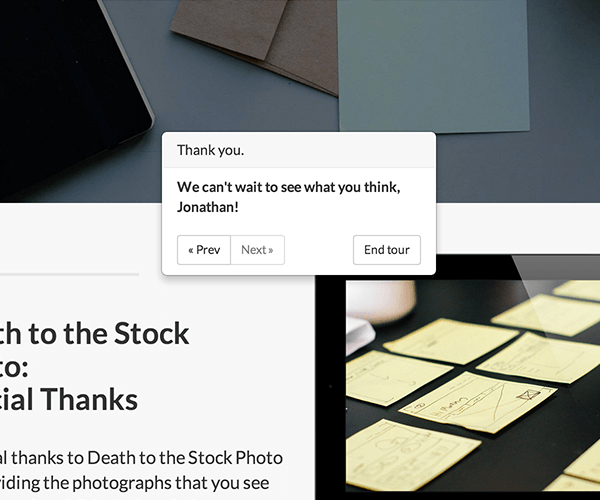 If that doesn’t make sense to you, read on – we’re going to break it down so you can create valuable, engaging instructions for your users. Why would I want to create instructions? If your website requires some level of familiarity, showing your users what to do can be very helpful. Once complete, the user can, in a way, see the “shadow” of the instruction you provided in the walkthrough. This avoids the user having to interpret directions if you used a less clear medium such as video, or even worse, textual guides. Another use case for an interactive tour is to describe a photo. Imagine you are building a site dedicated to showing off gorgeous panoramas of cities around the world. When a user clicks on a city, an interactive tour allows you to point out elements of the photo that may otherwise go unnoticed. There are plenty of use cases for when you would want to use a tour. When should I avoid using a tour? If your interface follows very clear conventions and you haven’t heard any complaints of confusion, adding a tour may block your users from doing what they want to do most: use your application. While we’re on the subject of what to avoid, it would be wise to keep your tour as short as possible. Users want to gather all necessary information to use your application or view your story, but they also want that to happen as quickly as possible. The only exception to this rule would be a site that relies almost exclusively on a tour as a core feature (the described photo site would be a possible example), but even in these cases, it should be easy for a user to exit the tour. Luckily, this is supported in Bootstrap Tour by default; an “End Tour” button is present at every step. Notice that you will also need to include Bootstrap’s base css file in order to display the Bootstrap popover. content: "We're going to make this quick and useful." // Initialize method on the Tour class. Get's everything loaded up and ready to go. This example was taken almost directly from the documentation, and is the easiest way to get started with Bootstrap Tour. Bootstrap Tour offers tons of options to customize each step of the tour you want to create. By default, it supports localStorage (to preserve your spot in the tour if you close the tab and return later), next and previous functions, plus all kinds of callbacks you can set up to respond to users’ actions. It also provides nice polish features such as an element highlighter, “reflex mode” (we’ll explain more below), auto-advancing steps, and even multi-page tours. 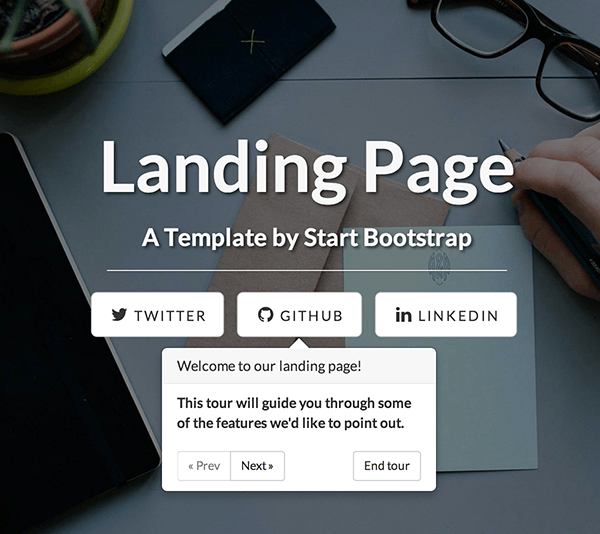 For the sake of this demo, we are going to start with a free template from StartBootstrap.com. StartBootstrap from Iron Summit Media Strategies is a collection of free and premium bootstrap themes. Once you’ve downloaded the projects, your file structure should look like this. Note: we’ve skipped FontAwesome’s internal structure, as it won’t be important to this tutorial. Let’s set up a few simple steps with the following code within our “script.js” file. content: "This tour will guide you through some of the features we'd like to point out." content: "Here are the sections of this page, easily laid out." content: "This is a section that you can read. It has valuable information." Then, we define a few step classes and associated arguments. Notice the third step’s “backdrop” argument; this highlights the element we’ve selected to attach the popover above. Next, we’ll add the step classes to the relevant elements. The top of our index file should now look like the following. 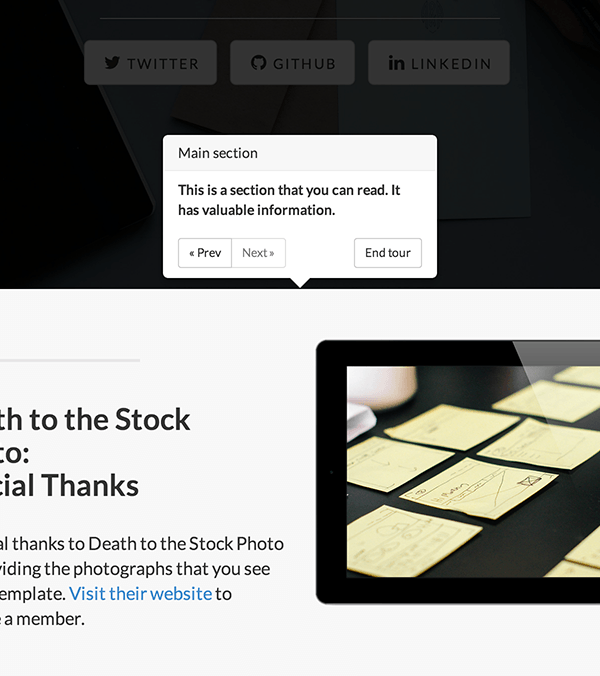 Note that the content and title arguments can be either a string or a function, which allows them to be evaluated at the time the popover is shown. The callback for the first step gets the user’s name (using Bootstrap’s built in classes for styling), and then we display that name in the second and last (new) step. If the user doesn’t enter a name, or enters only whitespace, we set the default name to “Friend”. Before you write your tour, write out the story of the user who is going to experience the tour. Figure out who the user is, and what they will think and do throughout the process. A tour is inherently set on some sort of timeline; take advantage of this. Develop a plot line, with a dynamic introduction, rise, and conclusion, and apply the concept to the tour. The aim of the poet is to inform or delight, or to combine together, in what he says, both pleasure and applicability to life. The purpose of art is to inform and delight. This snippet could show the user something at the end of the tour as a sort of “thank you” from the tour guide (that’s you) for completing the journey. HTML is pliable. Don’t just do things step by step; dive into using callbacks and watching user behavior to make experiences like tours more interactive. For instance, you could use this library to do a “choose your own adventure” style narrative that jumps between steps, using the goTo() method. Use callbacks to trigger rich behavior, like animations or iFrame injections. Get creative and remember the power of the medium. 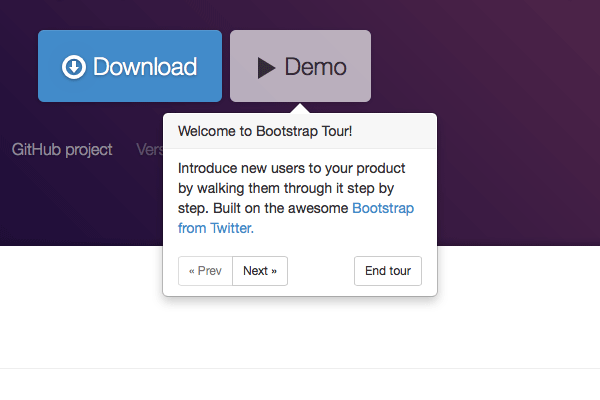 Bootstrap Tour is a powerful plugin that can get you started fast. If you apply best practices of UX and content design, a tour may be just the right thing to connect with your audience in a powerful way. Bootstrap Tour offers even more flexibility than we’ve covered here, so if you’d like a second article going even further with Bootstrap Tour, be sure to let us know in the comments! What other uses can you come up with? Let everyone know below!